Get in touch with the latest dual digitizer technology with the optional capacitive multi-touch screen and all new Intel® Core™ i3/i5/i7 vPro™ Processor . With its support of on-screen gestures, the dual digitizer takes user interaction to a new level, delivering a more efficient and convenient computing experience. 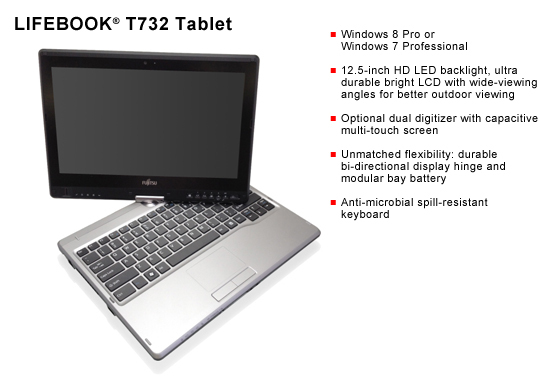 The LifeBook T732 Tablet PC offers the ultimate freedom of choice - optional dual digitizer with pen input and multi-touch interaction, modular bay, and optional bright display providing 160 degree vertical and horizontal viewing angles. Wireless service is not included with your notebook/ tablet PC. Activation, credit approval, and 2-year minimum commitment required. Monthly service fee, taxes, surcharges are extra. Actual connectivity is subject to wireless service provider’s coverage area and may be affected by equipment, topography, signal strength, environmental considerations, and other factors. Service may vary significantly within buildings. Coverage not available everywhere — see wireless carrier’s coverage map for details. Terms and Conditions and additional restrictions apply. A GPS application (compatible with NMEA v3.1 or later) must be purchased separately.